Last Thursday the weather people were predicting a 10% chance of rain for Saturday; Friday evening arrived and it started to rain and did not stop until the following evening. Washed clean, pinking up for the (hopefully) cool season. While Aloe 'Rooikappie' blooms off and on year round, autumn's cool-off brought out a big round of flowers. 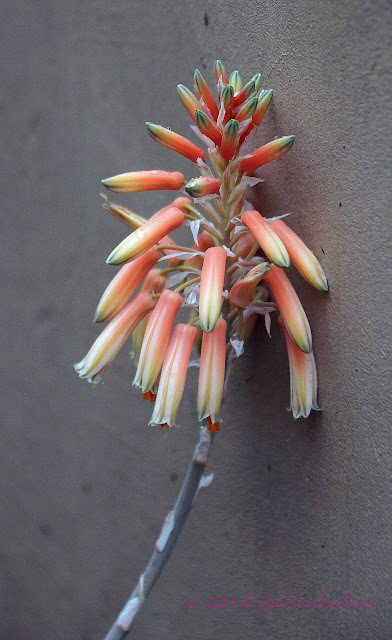 Aloe reitzii is blooming for the very first time. Senecio cylindricus has the typically ugly Senecio flowers, but bees like them. I'm glad somebody does. 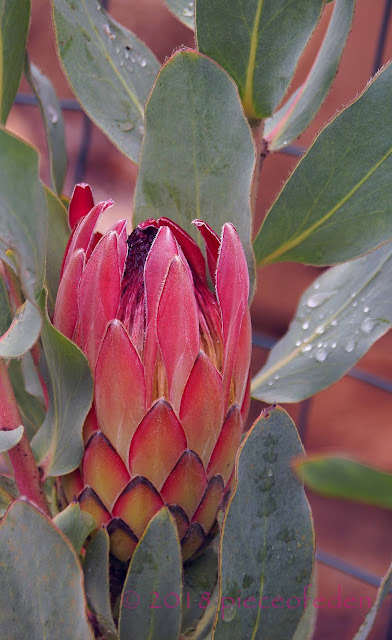 First flower ever from Protea 'Sylvia'. We likes it. 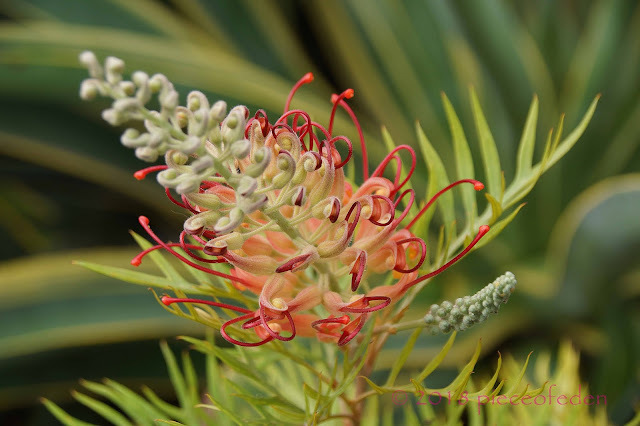 A gorgeous 'Ned Kelly' Grevillea flower. No dust, no dirt, no spider webs, no ants, just perfect and fresh. 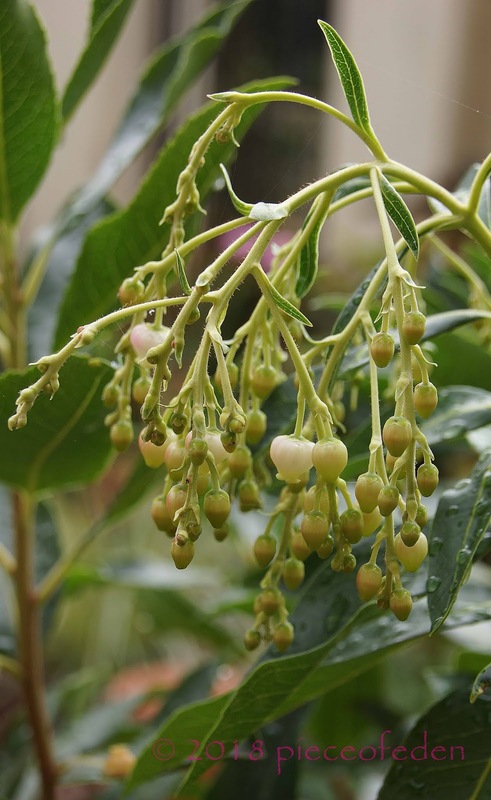 Arbutus 'Marina' decided to flower even though it is still in a pot. Crassula capitella 'Campfire' aka C. erosula 'Campfire' or C. subacallis ssp erosula. 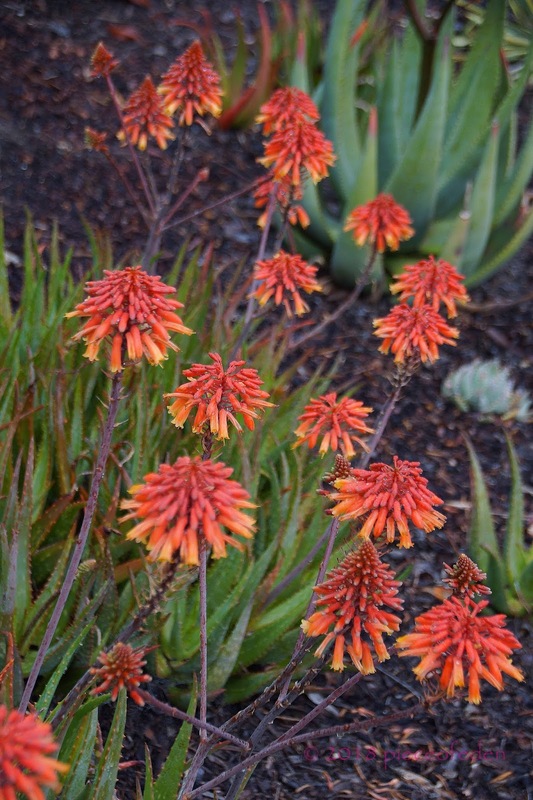 There is a different Crassula species also called 'Campfire' which is probably C. erosula. 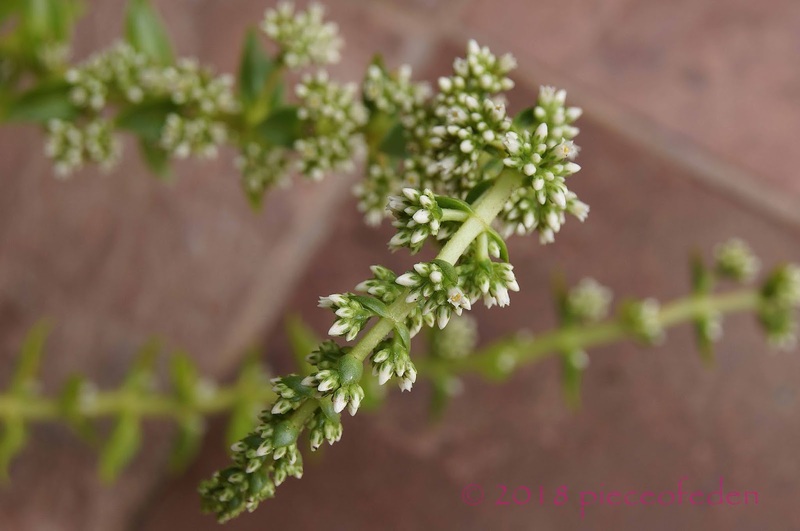 It's been growing in shade all summer because it can't take a lot of summer sun, so the red foliage color is green. 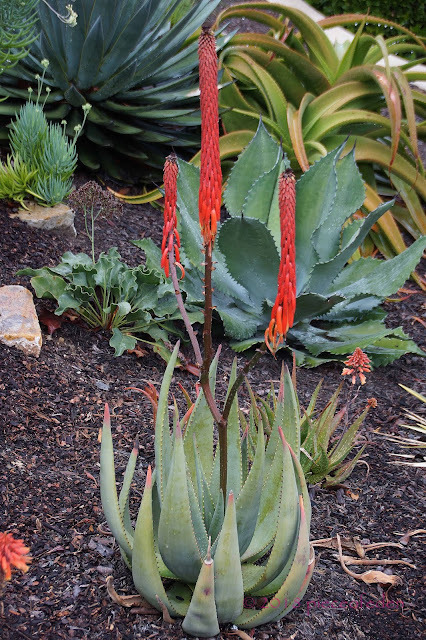 Anyway, it's blooming. Labels: Bloom Day Just A Bunch Of Flowers Let's Get Irrationally Happy About Rain! Grevilleas have been wonderful shrubs, and they are also magic for hummingbirds and bees--even better. 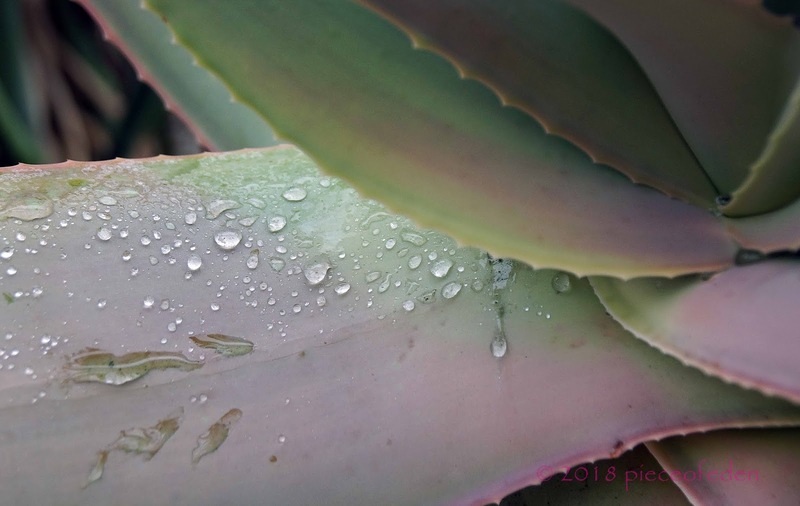 Water on foliage, yes, quite weirdly wonderful. If we get a good rainy season, they can forecast anything they want. You have such awesome plants. 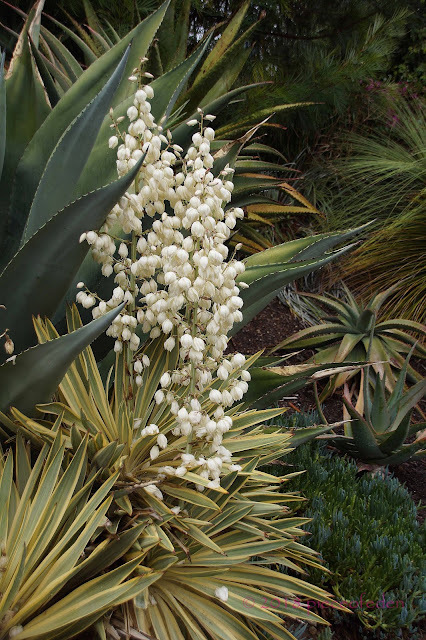 I love the yucca. Is that a smaller growing variety? 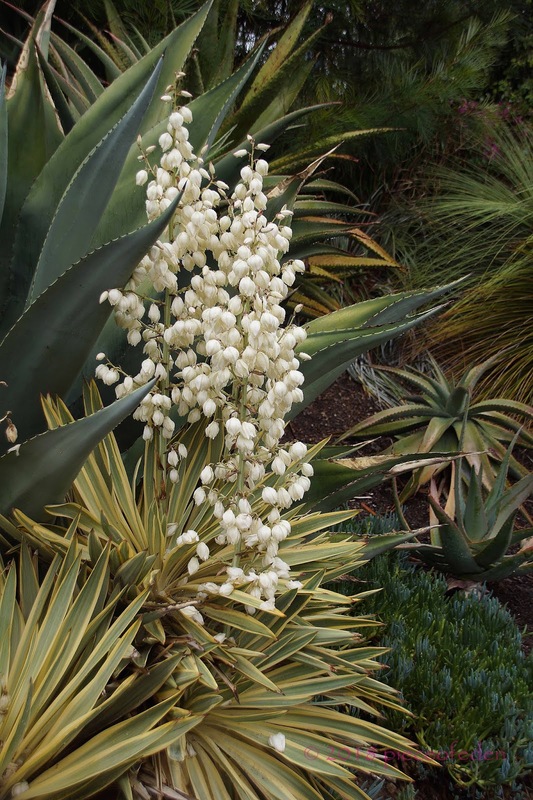 Yucca 'Bright Star' is smaller and slower growing because it has so much variegation (so much less chlorophyll). Eventually it might be quite big, given...decades? Happy Bloomday indeed, what a fresh bunch of flowers. 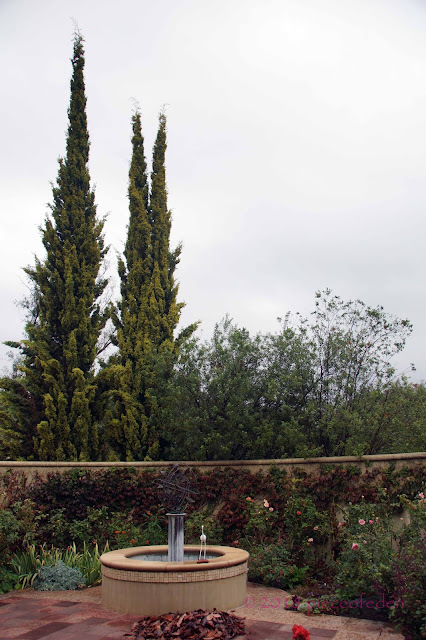 The garden does look so happy immediately after a rainstorm! Or are our blissful minds projecting that feeling? I guess it doesn't really matter. 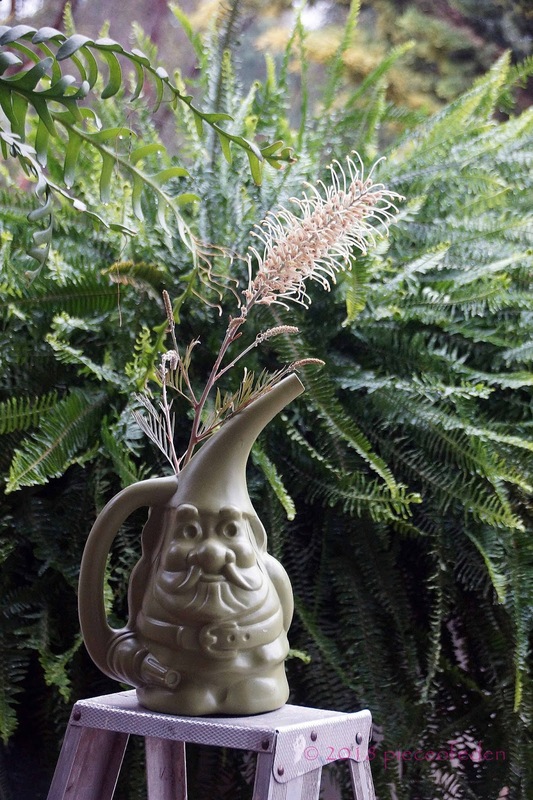 That watering can is the best use of a gnome I've ever seen and I'm envious of the 'Moonlight' bloom. The plant I got when out with you, Kay and Denise over a year ago has done precisely nothing, although it's still alive so that counts for something - and all the Grevilleas I've bought in 1-gallon containers seem to take their sweet time getting established. Sorry to hear 'Moonlight' has stayed "first quarter" instead of full. 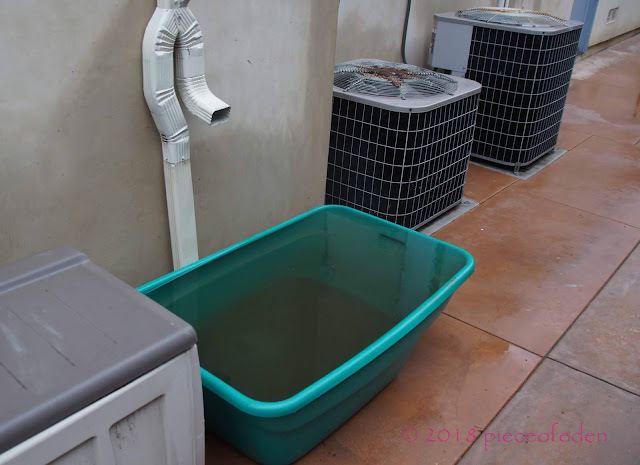 Try a little more water? No, I really could see a difference in every plant. They held themselves with more energy. And everything was a richer color. Then the wind hit. 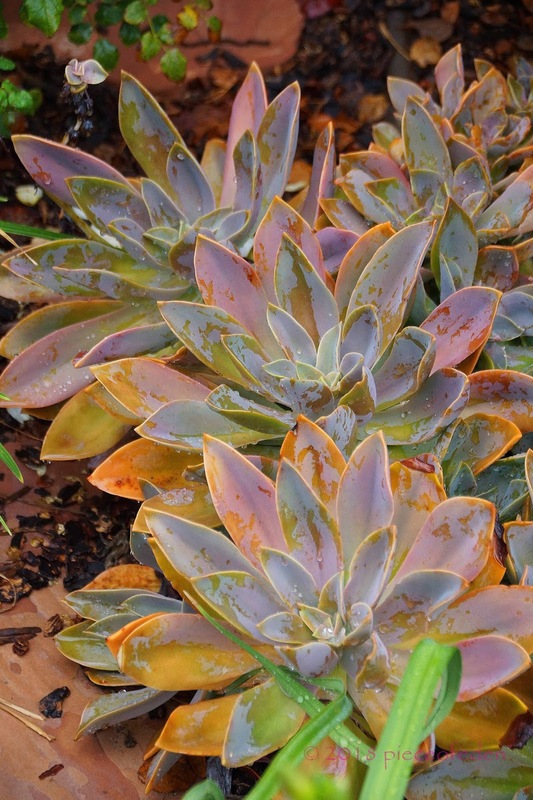 The evidence of recent rainwashing makes the pics of psychedelic succulents (Graptoveria?) and sultry 'Sylvia' Protea even sexier than they'd already be. 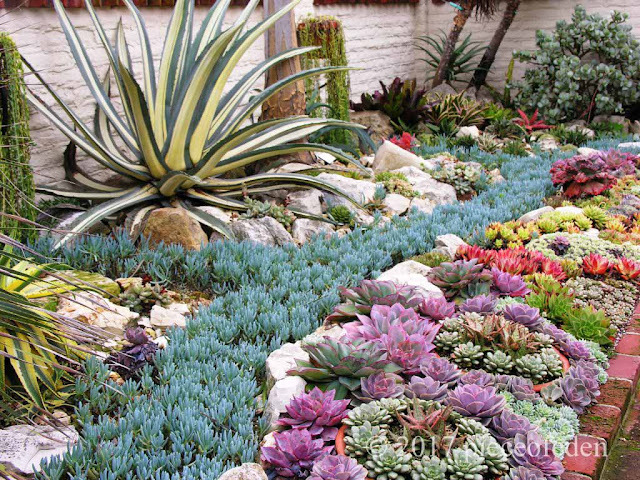 The gardener's giddiness comes through unmistakably! 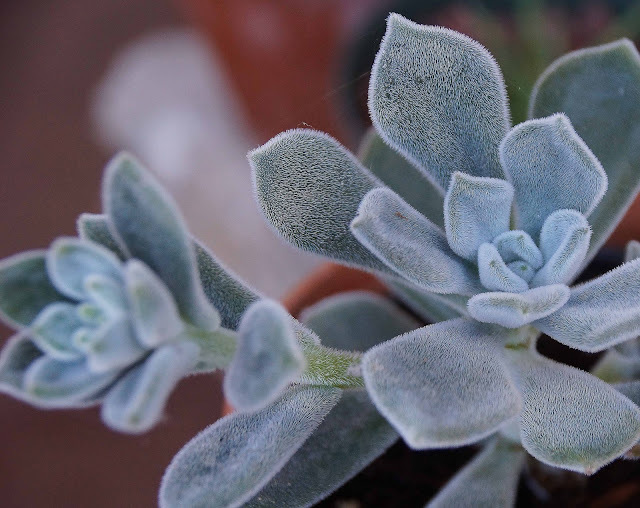 Graptoveria 'Fred Ives', yes. He dids look psychedelic after the rain. It was such a lovely surprise. Then...the wind hit. 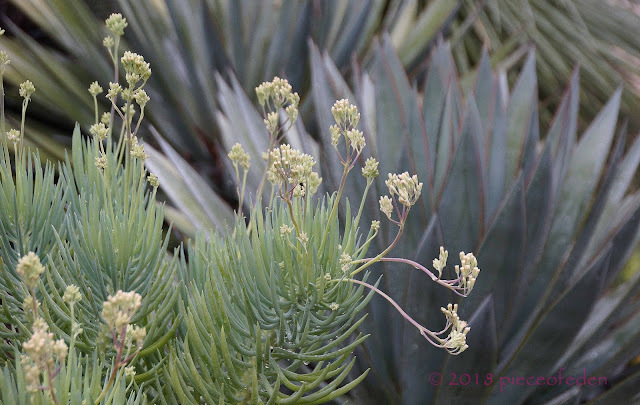 I am with the bees on how attractive the Senecio blooms are.It is an up tight plant. I am so happy to hear you got rain! Doesn't it feel wonderful and I bet the air feels good too. Everything smelled fresh and clean. 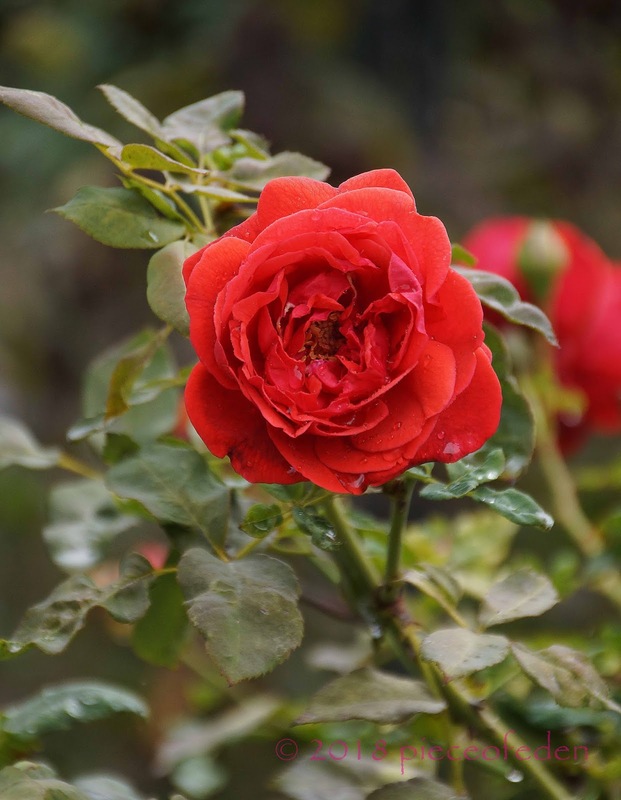 The sweetest fragrance of all. Wateringnome is good at raindancing!